In my last ECT TV episode, I showed you how to make a necklace with some chunky beads and chain. When you’re working with heavy or chunky beads, there are some special considerations to think about. 1. 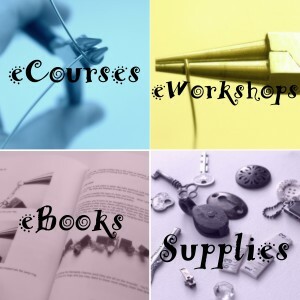 Use spacer beads, knots or wire wrap the beads to get them to drape correctly. With smaller beads you can just string them all together. When you’re using chunky beads you have to either use smaller spacer beads or knot in between the beads or the jewelry piece will not lay correctly. If you do not, the piece will be stiff and not drape well. The beads will become a solid block. In the necklace from ECT TV 50 (pictured above) I used spacer beads, but they kind of look like knots to me. 2. Use less of the beads in your jewelry piece. Chunky beads are also usually heavy. I hate that heavy feeling around my neck. So instead of creating an entire beaded necklace, I use half chain and half beads. 3. Use 2 crimp beads. I use 2 crimp beads in all of my pieces that I’m stringing, but with chunky beads it’s even more important to use 2 crimp beads to really make sure that your piece is secure. There are a variety of stringing wires with different “strands.” The higher that number is, the better the quality of your wire. Lower numbers have less strands and are more stiff and break easier. Higher numbers have more strands, are more flexible and are stronger. Use the highest strand number you can within your budget. 5. Use just one bead as a focal point. Another way to use chunky beads is to use just one of the beads as the focal point for your jewelry piece. You can then use smaller beads for the rest of a necklace or bracelet or create a pendant and slide it on a chain. Make sure your clasp will work with your chunky beads. If you’re stringing a bracelet, for example, make sure that the last few beads on the bracelet will fit through the clasp. I often will make chunky bracelets with big beads and then use a big clasp that the beads will fit through if I’m using a toggle clasp. Alternatively, you could use a lobster clasp or other clasp that the beads do not actually go through to close. 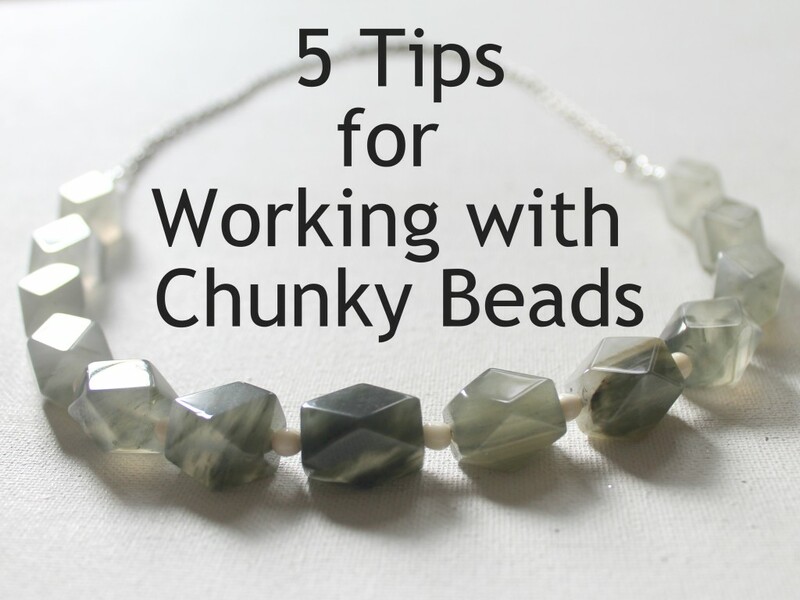 I hope these tips help you work with chunky beads successfully! Now go into your stash and get those beads you’ve been hanging onto until you figured out what to do with them (I know you have them) and create something! This entry was posted in Jewelry Making Techniques, Jewelry Tutorials and tagged chunky beads, how to make a chunky bracelet, how to make a chunky necklace, how to make jewelry, How to string, how to use chunky beads by Kimberlie. Bookmark the permalink.